Alderman William DeCourcy with his 86th birthday gifts. One of the DUP's best known Antrim councillors has decided to retire at the age of 86, after 18 years in politics. Alderman William DeCourcy has decided to step down from his role on Antrim and Newtownabbey Borough Council. He has been the recipient of much good natured-banter over the years due to his affection for Scottish football club Celtic FC, leading to him becoming known as the "only Celtic fan in the DUP". However, he denies that he is the only Celtic fan in the DUP, saying that there are a few "secret supporters" within the party. After lunch with his fellow DUP councillors on his 86th birthday on Monday he was presented with gifts marking his two great sporting loves - Celtic FC and the Ulster Rugby team. Alderman DeCourcy is also a keen fan of Crusaders in the Irish League. He grew up in the Sailortown area of Belfast before moving to Rathcoole after getting married and said he could tell plenty of stories about loyalist "'Buck' Alec Robinson and his lion" from his days living on York Street, but "nobody would believe them". Alderman DeCourcy and his wife have three children and he worked for many years at Gallaher's cigarette factory and later Northern Bank before entering politics in 2001 at the age of 68 on the old Newtownabbey Borough Council. 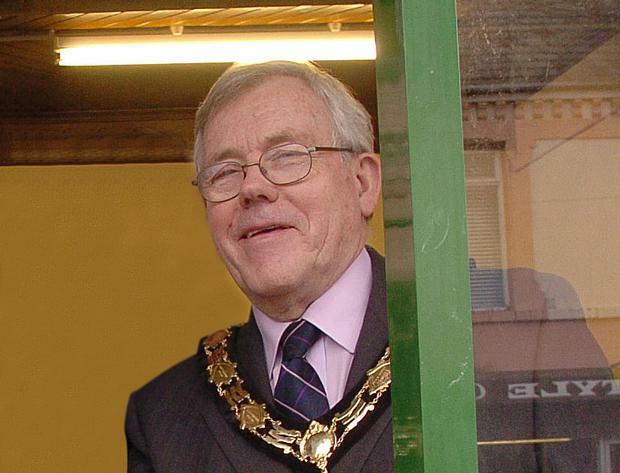 He served as Mayor of Newtownabbey in 2005/06 and also served two terms as deputy Mayor. The veteran DUP member is also heavily involved in his local Baptist Church. Alderman DeCourcy said that he felt the time had come to stand down, joking that he didn't want people to think he was "past it". "I think I will miss it. I enjoyed my work on the council and the councillors I worked with over the years. I never fell out with anyone and it broadened my mind," he said. The DUP representative said one of the highlights of his time on council was taking part in a "special" cross-border delegation to the Somme. "We went on a pilgrimage with representatives from Co Donegal and became friends with (the late Fine Gael TD) Paddy Harte," Alderman DeCourcy said. "I enjoyed helping the local community with things like road widening outside a school and having traffic lights erected, I also liked to help look out for older people and their constituency issues. "I'm a local guy and my door was always open to anyone who wanted to call. I've been in the same house nearly 60 years and Rathcoole isn't a bad place to live." Alderman DeCourcy said that he became a Celtic supporter because of his admiration for Belfast Celtic star Charlie Tully who later went on to play for the Glasgow giants. The former DUP mayor has supported Celtic since he was a child. "When I went to the soccer as a young man all this hatred stuff wasn't part of it, I'll always love Charlie Tullly, he was my favourite player of all-time apart from maybe Georgie Best," he explained. "He led me into Celtic and I have always been a big Crusaders man. I'm a big Ulster Rugby fan too and was down in Dublin on Saturday. It was a great day. To tell the truth, I enjoy the rugby even more than the soccer now." 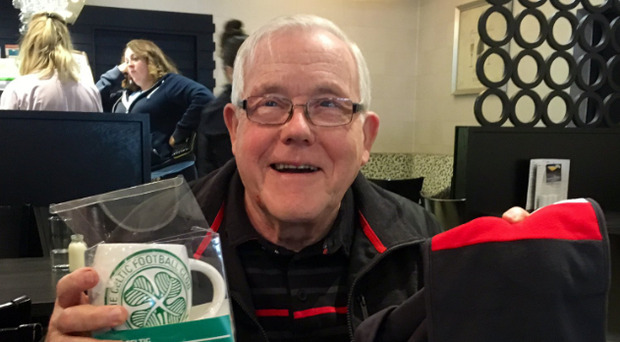 The Celts fan comes from a family that includes Linfield and Rangers supporters, but Alderman DeCourcy said he wasn't gloating after the Old Firm game on Sunday. "I don't rub it into them much, just give a wry smile when they score," he joked. Alderman DeCourcy said he was disappointed by the current state of politics in Northern Ireland and that as a Brexit supporter he was worried it now wouldn't happen. "Nobody can be happy with the state of politics at the minute if nobody's representing anybody," he said. Alderman DeCourcy's three loves were celebrated for his 80th birthday. "My health's been good and I've been very lucky, I'll be staying in the party but when you're out of politics you're out. "I have no regrets about entering politics, my church is a big part of my life, I've got good health and the Lord's been good to me. I've also been lucky to have a wonderful wife and family." 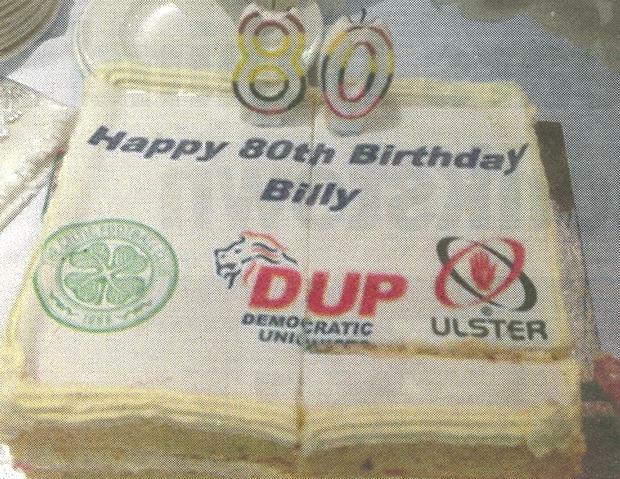 DUP Leader Arlene Foster said: “Billy has been a faithful servant of the people of his beloved Rathcoole for 17 years. His constituents have rewarded his years of exemplary service by returning him with more votes than other candidate in every election since 2001. "Billy has gained the respect and admiration of those from all political outlooks for his genuine commitment to improving the lives of those most in need." Former Mayor of Antrim and Newtownabbey and Alderman DeCourcy's DUP colleague Thomas Hogg paid tribute to the departing councillor. Councillor Hogg said that Alderman DeCourcy's popularity in the area had been proven after he topped the poll at four consecutive elections. "He's been a great support to his colleagues and friends across all parties in the chamber, he's a man of strong Christian principles and he's very generous and compassionate in his dealings with others. He always looks out for the underdog" he said. "He's a strong-DUP representative but he would get on well with all the nationalist councillors and always likes to be as inclusive as he can, he could teach us all a thing or two. "He'll be missed, but he'll still be out canvassing and involved in various things."